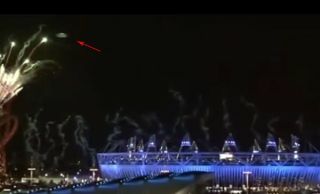 A UFO spotted in footage of the Olympics opening ceremony on NBC. About a billion Earthlings watched the Olympics opening ceremony Friday night. Did an out-of-this-world spectator tune in as well? A dimly lit, disk-shape object was spotted hovering above the stadium in NBC footage of the ceremony, and the Web has since come alive with exhaustive analysis of this "Olympic UFO." "It is clearly not a blimp or a helicopter, so what is it?" a blogger wrote on Examiner.com. "We may never know for sure." But such a dismissal was a tad premature. An image posted to the Goodyear Blimp "Spot the Blimp" website. "Remember that these photos are taken from the website of the Goodyear Blimp. And I think those people know their own Blimp when they see it," Sheaffer wrote. "The resemblance between this object and the unknown object in the video is obvious." Final confirmation came from Goodyear itself late last night. "Wow we really seem to have caused a #UFO phenomenon!" @goodyear_uk wrote on Twitter. "[S]orry to disappoint guys! We still think a blimp is pretty cool though!" Still, some UFO believers aren't convinced. One Twitter user replied, "not so sure about that!" This story was provided by Life's Little Mysteries, sister site to SPACE.com. Follow Natalie Wolchover on Twitter @nattyover or Life's Little Mysteries @llmysteries. We're also on Facebook & Google+.